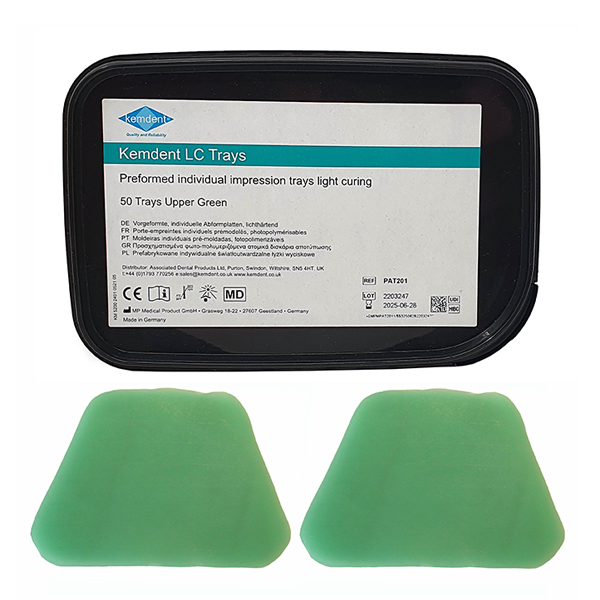 Kemdent Light-Cure Tray blanks allow easy fabrication of custom impression trays. They can be cured quickly under halogen and UVA light. Traditional self-cure acrylic special tray materials are more difficult to use, consequently material can be wasted. Only the most cost-effective materials are suitable for use in our highly competitive market. Kemdent Light-Cure trays have an indefinite working time, are non-sticky and easy to adapt and trim at the dough stage. The material can be re-used, does not slump and has minimum shrinkage even when forming a handle. On curing Kemdent Light-Cure trays become extremely rigid and dimensionally stable which eliminates the risk of hidden distortion during the impression taking procedure. The benefits to the patient are significant, saving the technician and dentist consequent errors, disputes and costs. 1. Prepare the model properly. Ensure any undercuts are sufficiently blocked out. Then soak the model in water to prevent the wax spacer and Kemdent Light-Cure Tray material from sticking to the model. It is a good idea at this stage, too, to mark the centre of the model with a pencil before adapting the wax spacer, which will make it easier when attaching the tray handle. 2. Apply the wax spacer and trim away any excess. 3. Adapt Kemdent Light-Cure Tray material and remove any excess with a wax knife or other suitable. After removing the wax spacer, finish off the margins with a carbide bur instrument. Some of the excess is used to form the handle, which is then adapted onto the rest of the tray to complete it. If desired, perforations can be made at this stage with an appropriate pointed instrument. 4. Light-cure the tray for five minutes in a suitable light-curing unit, either halogen or UV light. Take the tray away from the light source and remove the wax spacer. You will find that the wax spacer is quite easy to remove from the tray and the model at this point. 5. Return the tray only to the light source, upside down and cure for a further three minutes. Remove any excess material with a carbide bur. The tray can be smoothed off with a silicone wheel or point. 6. The finished special tray can be cleaned by either using boiling water or a steam cleaner to remove any residual wax and debris. If desired, perforations can be made at this stage with an appropriate carbide bur.